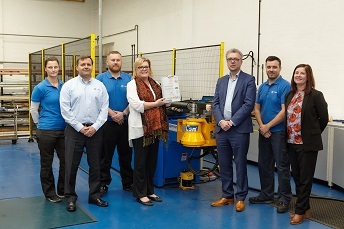 Derby based Tidyco is celebrating after recently being presented with ISO 9001:2015 certification during a ceremony at its headquarters this week. By confirming its commitment to having a best in class Quality Management System (QMS), this significant achievement is part of the company’s continuing efforts to set the standard in an increasingly competitive market. As a leading supplier of hydraulic and pneumatic products and services to the rail sector for over 40 years, Tidyco also works closely with defence, utilities and manufacturing organisations in over 50 countries across the globe. Tidyco has held ISO 9001 for over 15 years, which was originally the responsibility of James Tidy, who was Tidyco’s QA Manager prior to becoming managing director 3 years ago. This QMS was updated in September 2018 to include some new key features that have been designed to benefit all businesses and help them to identify opportunities for improvement and effectively manage and measure performance. Certified through SGS, the world’s leading inspection, verification, testing and certification company, a rigorous audit was conducted on Tidyco’ s QMS to assess the organisation’s dedication to the on-going improvement of its processes. As a result, the scope of its ISO 9001:2015 certification covers the design, manufacture, supply and of hydraulic and pneumatic hose assemblies, hydraulic jacks, rams, and other equipment and accessories – as well as a fully equipped workshop able to repair or overhaul all of the aforementioned products. Its dedication to producing components of the highest quality led to Tidyco purchasing a new tube bending technology – part of an on-going investment programme that allows it to control the production process in line with the requirements of ISO 9001:2015. This state-of-the-art computer numerical control (CNC) based automated tube-bending machine was part funded by the University of Derby's Invest to Grow programme that provides grants and loans to support businesses across the East Midlands to innovate and create jobs. This investment has proven so successful that Tidyco are well on the way to making a full return on its outlay within the first 12 months, while allowing shop floor personnel to enhance their skills and provide customers with a more agile and responsive service. SGS is launching an online portal, SGS Online Services, to make its testing, inspection and certification services accessible to all in one click. The platform offers a dedicated range of services to help companies reduce risk, streamline processes and operate in a more sustainable manner.